In fall 2017 a string of natural disasters, including hurricanes Harvey, Irma and Maria, devastated Texas, Puerto Rico and the U.S. Virgin Islands. 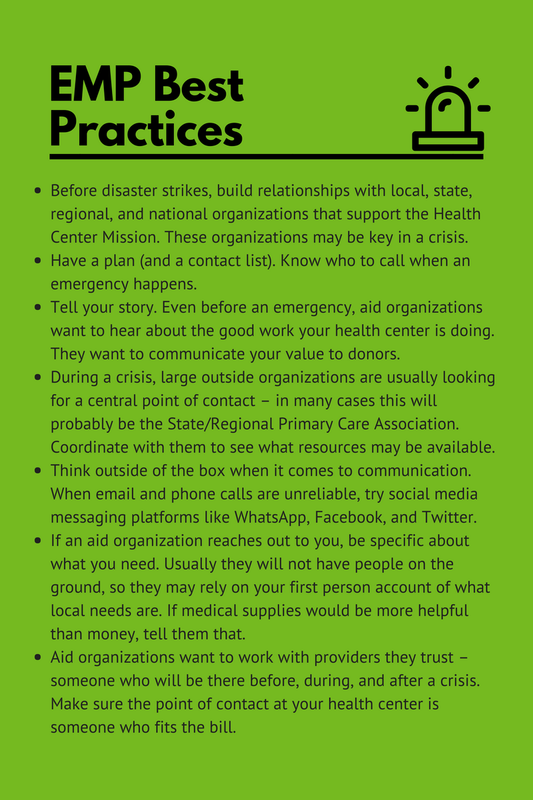 In the wake of these crises, NACHC spoke with health centers, primary care associations, and disaster aid organizations to discuss lessons learned and other takeaways from being in the eye of these deadly storms. NACHC spoke with two of those long-term partners: Feygele Jacobs, President and CEO of the RCHN Community Health Foundation (RCHN CHF) and Damon Taugher, Director of USA Programs for Direct Relief. Because these organizations have longstanding relationships with health centers and NACHC, we recently engaged them in a discussion about how health centers can effectively leverage aid organizations in times of crisis. RCHN CHF’s mission is to support and benefit Federally Qualified Community Health Centers and the communities and patients they serve, so when Hurricane Maria struck Puerto Rico, the organization was quick to step in to help. Coordinating with the Hispanic Federation, RCHN helped get money and supplies to impacted health centers. While the Hispanic Federation knew about the mission of health centers, they were not active partners. Educating the Federation to commit new resources toward the response in Puerto Rico was key. RCHN’s Feygele Jacobs describes the challenges in trying to assess what is needed when communication channels are down. Direct Relief has a 70-year history of supporting health care providers worldwide and specifically focuses on delivering donated medicine and medical supplies to the world’s most vulnerable. We asked Damon Taugher why Direct Relief looked to help health centers. Direct Relief’s Damon Taugher describes why the organization works with health centers to respond to disasters. Following Hurricane Harvey in Texas, Direct Relief made more than $100 million in medical inventory available to support medical relief and recovery efforts. And after the devastation of hurricanes Harvey and Irma, Direct Relief worked with the Florida Association of Community Health Centers (FACHC), Texas Association of Community Health Centers (TACHC), NACHC, and the National Association of Free and Charitable Clinics to establish the Hurricane Community Health Fund. Additionally, after Hurricane Maria, they established a fund for health centers in Puerto Rico and the U.S. Virgin Islands. These resources were further advanced by partnerships with others like the Clinton Foundation to look at solar power resiliency and an eventual $50M contribution from AbbVie to support health centers in Puerto Rico longer term. Damon Taugher on why establishing and fostering relationships is important in a disaster situation.